Last Wednesday night my husband and I took a red-eye flight to New York City and arrived home safely early this morning after having our flight delayed 3.5 hours. It was the type of trip we will always look back on fondly. You see… this is the first time we have been away from our kids in almost 9 years. Instead of having to worry about finding kid-friendly restaurants and places to go, we just went where ever we wanted to. 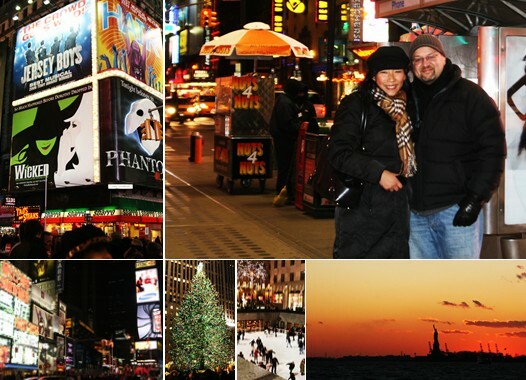 It was the perfect time of year to visit with the hustle and bustle of Times Square as well as other touristy spots. However, this trip was not planned but an opportunity that presented itself. The kind folks at Bon Appetit Magazine contacted me last month inviting me to come to New York for a Bloggers Bake Off Party. Initially, I was planning on coming alone. However, after family members rallied to help with childcare, we bought an airline ticket for my husband too. Just like that we called this trip our “10 year Anniversary, Christmas, and Birthday presents” to ourselves and had the greatest time exploring the city together for the first time. The first day we arrived, we stayed with Olga of SassyRadish.com. She has to be one of the most wonderful people I know. She was such a gracious and generous hostess I only wish we lived closer. Her Guinness Stout Ginger Cake was so amazing I probably ate at least half just to myself. Then there was my other friend Jennifer Perillo of In Jennies Kitchen, whom I adore very much. We were roommates in San Francisco for BlogherFood and spending time with her almost the whole day was wonderful. I also wished we lived closer because she is a amazing friend. For the party I brought with me from Seattle – Salted Caramel Bourbon Bacon Bars. My dessert was 1 of 20 entries and the winning entry was my friend, Marc Matsumoto of NoRecipes.com. In my opinion, his Kabocha Pumpkin Cream Cake was one of the best desserts I have ever had the privilege of eating. His entry was in a class of its own and deserving of the first place prize. 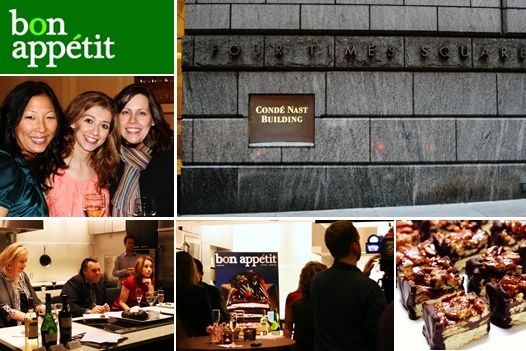 To see a slide show of the event, click here to the Bon Appetit site. The next evening Marc, Olga, Rob, and I had dinner in the East Village at a Soba Noodle house where they make their own noodles. Marc then took us to some great little spice shops where I brought home tea bag dashi and black cardamon pods. The rest of our time in New York City was spent being tourists and spending time with friends of my husband who came down from Boston to meet us (Thank you Kristin and Bruce!). All in all it was one of my highlights of the year. Many thanks to everyone who helped make this trip happen, especially our families who provided love and care to our 3 kids while we were gone. Glad to be home. Alice, how exciting! I’m so very happy to hear about this. An amazing oportunity and trip, and meeting with friends with your husband by your side! Congartulations! Happy holiday too (if I don’t see you beofre)! How awesome, Alice!!! Sounds like an amazing opportunity! Aww thanks! Glad you had a good time here and hopefully we’ll be seeing you out here again soon. Nice post, and thanks for sharing Bon Appétit is one of the largest food magazines, with an average monthly circulation approaching 1.5 million, there are plenty of others out there, as well as bloggers and websites and Food Network shows and other TV programs. Hey Alice, I just wanted to say how wonderful it was to meet you at the BA Bake-Off. It sounds like you had a great trip! I look forward to reading about the fun things you bring into your kitchen. It was so nice having you on my home turf for a few days. Would you mind flying in once a week so we can have breakfast? Rob doesn’t mind taking care of the kids, right Rob? Sounds like a wonderful trip!!! Wow – that is so awesome that you got to meet Francois Payard! Sounds like a blast! Happy belated anniversary you two! I am glad that you had such a great time in NYC! 🙂 I love Olga, Jennifer, and Mark! I wish I could just take a day off from school to meet up with my fellow tri-state area food bloggers. Would be awesome! Wow, congratulations. Even though I’ve been only following your blog for a short time this honor is richly deserved. You rock! Alice Congratulations. I’m so happy for you. I know that trip had to be so much fun. Glad you and hubby got a little time away. I’ve never been to NYC either and would love to go. Sounds like such a wonderful trip! I know how difficult it is to travel away from the children but it’s nice to get a break and spend time with each other. I’m not a baker but I would have loved to be one of those judges. Yum. How fun!! Glad you had such a good time! Alright, Alice! What an amazing opportunity. I’m so happy for you. This looks fantastic…so important to have that time together!